Thomas Hamilton, 1829-34. Stone flagged pavement with drainage channel; decorative cast-iron railings set on low ashlar coped wall. Round-arched entrance to stone staircase with droved ashlar walls and cast-iron handrail. Wall-mounted and standard cast-iron lamps. 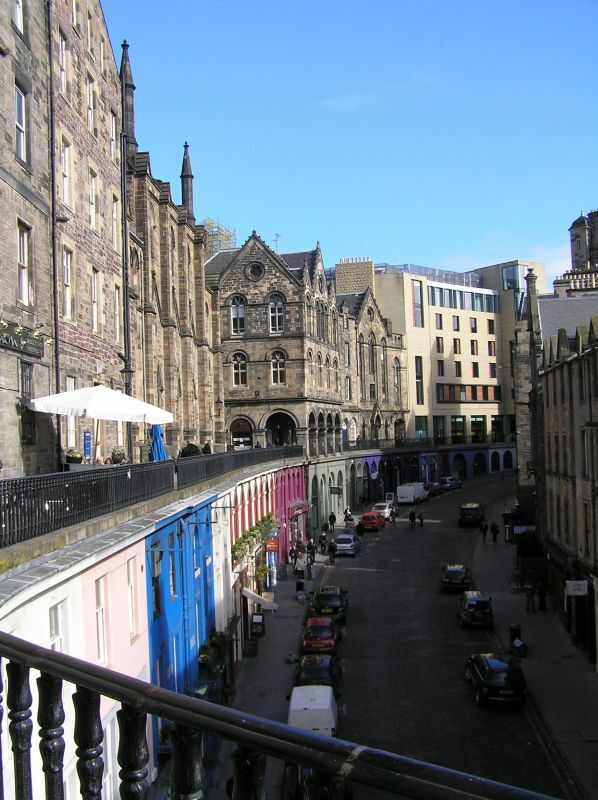 Victoria Terrace forms a pavement, built on the roofs of the shops in Victoria Street, leading from George IV Bridge to Johnston Terrace. Formerly the arcade which forms part of the ground floor of the Quaker Meeting House (separately listed) was mirrored at the corner of Victoria Terrace and Melbourne Place (George IV Bridge). Victoria Street and Terrace were part of Thomas Hamilton's plan for the new Southern and Western Approaches to the city. Hamilton was appointed architect to the Commissioners for the 1827 Improvement Act, and carried out the 2 major town planning initiatives for which they were responsible - the W approach - King's Bridge and Johnston Terrace, and the S approach - George IV Bridge, and the link to the Grassmarket - Victoria Street. In 1998 Victoria Terrace was restored by the Old Town Renewal Trust.